The freezing cold temperatures in Moscow did not prevent thousands of spectators from flocking to one of its parks to witness flying ice-skaters. RT’s Konstantin Potapov was there to watch them. 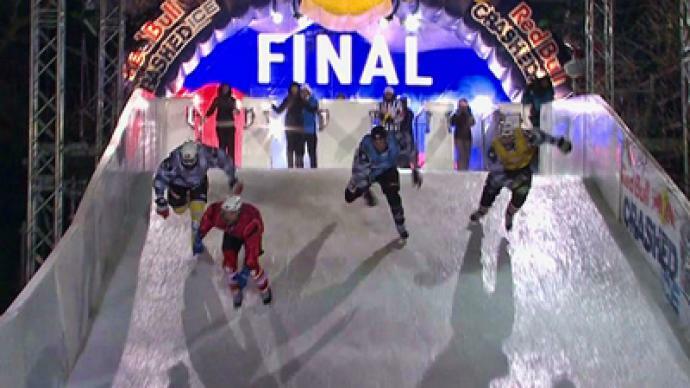 An impressive 350-meter-long ice track was erected at Kolomensky Park in Moscow to host the crucial third stage of the Crashed Ice World Championship. The downhill international ice skating elite from 24 countries were eager to put their skills to the test, at the toughest venue in the history of this new sport. “It's the most difficult track. It's not very fast but it's very challenging as there are many obstacles coming one after another. That's why there are so many falls on the course. It's very hard to prepare for all those tricky obstructions,” says one of the participants, Andrey Lavrov. Despite the freezing cold with temperatures dropping as low as -22 degrees, thousands of spectators still dared to attend the event, and no one was disappointed. The hot action melted the ice, and all eyes were on the track. Russians are new to this kind of ice sport, but are keen to learn quickly. One of them, Lavrov, was hoping to gain some points on home ground. He staked a major claim for a place in the final, but failed to progress at the last hurdle. “Unfortunately I was just too tired. I was eager to produce my best result but my legs just wouldn't go. It's very hard to get prepared for such events, and it's difficult to stay in top form,” he said after the event. So the final turned out to be a fierce duel between current leaders Arttu Pilhainen of Finland and Canada's Kyle Croxall. The flying Finn picked up where he left off from the previous event, dominating all the runs. Pilhainen easily stormed to his second successive victory, extending his lead at the top of the rankings. There is still everything to battle for at the fourth and decisive stage in Quebec. So a tense fight to the finish between Pihlainen and Croxall is anticipated on March 19.